Lowering Parking Minimums Is Nowhere Close to a "War on Cars"
Slightly easing a policy that FORCES excessive parking into the landscape is a far cry from actually restraining car use or ownership. Please get this straight. Today’s conventional parking policies are not mode neutral. They are not agnostic about people’s mobility choices. They are not a natural expression of individuals’ preferences about our transport systems or our towns and cities. In fact, the American-style conventional parking policies that have spread around the world are just about as far from mode neutral as they could possibly be. These policies don’t just acquiesce to people’s car preferences. They shape those preferences. They effectively pull people into cars and reshape the landscape to keep them there. The process of setting parking requirements makes arbitrary but self-fulfilling prophecies about how many people will own and use cars in every single building far into the future The process often even aims to make enough room for the busiest time of the busiest day of the year. The procedure generally assumes that all this parking will be free-of-charge to the motorists. This prompts parking to be bundled with all other real estate, effectively forcing private actors (including you and me) to cross-subsidise car ownership and car use. So most new developments being built around the world continue to include much more parking than we need or than the actual users would willingly pay for. Speaking of the “war on cars,” elsewhere on the Network today, West North reports that, in response to a plan that will reduce parking 0.2 percent in D.C.’s Downtown and Golden Triangle areas, the local AAA complained that “the bike lanes have taken up all the parking spaces.” Bike Denver explains the impressive strides the Mile High City has made in its commitment to become a multi-modal city. And Stop and Move wonders what Fresno could learn from Oklahoma City. A ‘war on cars’ would be more like burning cars randomly – which is clearly not a good idea and violates property rights. But what we do have today, as well expressed in this article, is a massive subsidization of cars that encourages us to own a car given how cheap it appears to be – paid of course by someone, somewhere including non-car drivers –but not necessarily the user. None of these are a war on cars. It’s a war on traffic, a war on congestion. A war on pedestrian fatalities. A war on time wasted stuck in gridlock. A fight to be able to get places as we please rather than being forced into a metal cage crawling stop-and-go at 3mph. I like this article on parking because a lot of space can be revitalized more efficiently. Fully understanding that parking businesses are good tax base for municipalities. However, between the price of gasoline and parking rates I do believe there is a creative way to see the landscape change. It is a waste of time to sit in traffic pulling individuals away from what is the most important attribute within a society, family. I am in the minority on this one but as a non-driving urbanist, my view is that we do need a war on cars. It’s impolitic of course but cars are dangerous to bikers/pedestrians, pollutant-spewing and take up lane space for my buses. I think it’s odd to spend so much effort getting worked up over this: “de-emphasizing” cars vs. war on cars is semantics. I guess semantics matter in terms of building coalitions to get things done so I get it but the outraged tone is a bit disingenuous. As the price of gasoline climbs ever higher and takes an even bigger bite out of the average working American’s paycheck whose wages have been stagnant for the past 40 years while the cost of living has increased exponentially, the people who chant about a “war on cars” will be singing a different tune sooner rather than later. Parking minimums need to be replaced with parking maximums. Developers will always overbuild parking b/c people see it as a necessity. Parking ratios need to be targeted to what it would take to get people to not drive. Also, parking should be “unbundled” from the rent or the price of the condo so those who don’t need parking don’t have to pay for it. It also makes the unit more affordable by at least $50K. To my mind a discussion regarding cars and urban parking must include, if not emphasize, mass transit and improving its ease of use. Personally I love bicycles, but fear for life and limb when sharing the the road with distracted motorist. So, I walk and wish everyone could live near their work. This just shows how hard it is to get reforms. 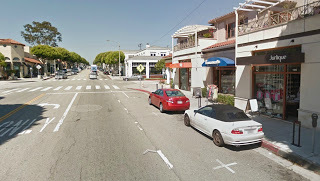 Santa Monica is a certified bike-friendly community, with a developed sidewalk network, non-motorized rights of way, and a locally controlled high quality transit provider along with Metro. And it’s a city where ostensibly everybody is green. It’s a tough battle. But building political feasibility to make positive changes in cities takes such semantics. We here in Ithaca, NY are taking a look at this very issue and we have so many people, including our Mayor, willing to come out and speak of the change, yet it’s still only being discussed behind the scenes and “in committee”, not yet infront of Council where it could be discussed and voted on. A revenue-neutral gasoline tax that works up to perhaps $5/gallon would be great. Start at $1/gallon and steadily increase. Use some of the money for better public transit, walking and biking infrastructure, and give the rest back to the people. Or 100% of it back to the people. Drive less you save. How Is a Parking Space Different From a Toilet?